As was the case with other late 19th century journeymen, the major-league playing career of catcher Tom Gunning was not the signal accomplishment of his life. Upon leaving the game in 1890, he completed his medical school studies and returned to his hometown of Fall River, Massachusetts, where he practiced medicine for almost 40 years. In addition to treating patients, a young Dr. Gunning assisted in the autopsies performed in the notorious Lizzie Borden axe-murder case. Some years later, he assumed the posts of Fall River city physician and city/county medical examiner. In his off-duty hours, Gunning busied himself with civic and political affairs, intermittently holding a number of local community and governmental offices. By the time of his death in 1931, “old-time big league ballplayer”1 Tom Gunning was counted among Fall River’s most distinguished citizens. Thomas Francis Gunning was born in Newmarket, New Hampshire, on March 4, 1862. His parents, saloonkeeper Robert Gunning (1833-1891) and his wife, the former Mary Reynolds (1838-1919), were Irish Catholic immigrants2who met, married, and began their family in New England.3 In 1873 the Gunnings moved to Fall River, then on the cusp of a boom in the local textile industry that would expand the city population from 26,766 in 1870 to over 100,000 by 1900.4Tom attended local public schools through high school, and would reside in Fall River for the remainder of his life. Although signed to a Boston Beaneaters contract, Gunning spent most of the 1884 season with the Boston Reserves, a Beaneaters auxiliary placed in the Massachusetts League. Composed of clubs in Holyoke, Lynn, Lawrence, and other in-state venues, plus the Reserves, the Massachusetts League was created to nurture prospects while at the same time depriving the upstart Union Association of potential players.12 In the Reserves lineup for 44 games, Gunning played every field position except second base and batted a solid .308.13 Meanwhile in Boston, the rigors of 1880s catching were taking their toll, inevitably requiring Gunning’s recall to the parent club. On July 26, 1884, he made his major-league debut, forming the Boston battery with fellow Reserves alumnus John Connor for an away game against the New York Gothams (soon-to-be Giants). Sadly, it did not go well for the pair. Connor, nervous and wild, walked four batters during a five-run New York first inning. He also made four fielding errors on the way to taking a 12-3 pasting. Gunning was no better, allowing six passed balls while going 0-for-4 at bat against future Hall of Famer Mickey Welch. Three days later in Philadelphia, Gunning was back on the field, but in a different capacity. With the designated league arbiter indisposed, the novice backstop was tabbed to umpire the Beaneaters-Phillies contest. The 9-1 Philadelphia win, registered without complaint about the officiating from either side, established a precedent. Before his major-league career was done, Gunning would serve as an emergency umpire at least nine more times. 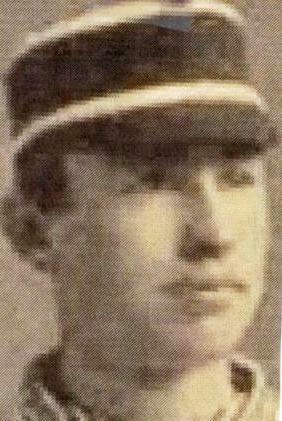 During the offseason, Gunning and Boston teammate Jim Manning returned home to Fall River and took up the rugged new sport of roller polo, playing matches for the Fall River Polo Club.17 As the 1885 baseball campaign approached, the Boston Herald described Gunning as “one of the colts of the team who was broken in last season. He showed himself to be a clever catcher and one of the pluckiest on the ball field.”18 Often the receiver of the punishing shoots of Jim Whitney that season, Gunning’s work was frequently extolled in the press. His catching was “excellent” in a 6-5 win over the Giants.19“Gunning was superb and he was commended on all sides” in a 3-2 loss to Detroit;20was complimented for “some fine playing” in a rain-shortened 1-0 victory over Buffalo;21 and played “a phenomenal game behind the bat” in a 4-3 loss to St. Louis.22 Still, Gunning’s defensive work was far from flawless; witness the five passed balls that he allowed in a 7-3 win over Providence in mid-August. And his 46 passed balls (in only 48 games played) placed him at or near the NL worst for the 1885 season.23 On offense, Gunning was more consistent. He did not hit at all, posting a woeful .184/.207/.201 slash line. Boston (46-66) slumped in NL standings, falling to fifth place, and the light-hitting Gunning was not reserved for the next season by the club. Perhaps seeing little long-term future in the game, he continued to further his education. A month after the 1885 season ended, the Boston Herald announced that “Thomas F. Gunning, the popular catcher of the Boston League team, has entered Boston College and is to take the complete course.”24 The following spring, something that could never happen today took place: Tom Gunning was a member of both a professional baseball team and a college nine – simultaneously. On Chestnut Hill, he served on the three-man committee that selected the Boston College squad, and he would do the Eagles’ catching himself when his professional commitments would allow.25 Otherwise, he remained one of the Boston Beaneaters’ four catchers. Shortly after the season ended, the Quakers surprisingly released Gunning, a move that “caused much unfavorable comment” among club followers.37In search of backstop help, the American Association champion St. Louis Browns made an immediate run at Gunning, offering him a handsome $2,200 contract for the 1888 season.38 But Tom had no interest in leaving the City of Brotherly Love. He had just commenced studies at the University of Pennsylvania Medical School. Gunning’s need to remain in Philadelphia and his desire to continue playing ball were then happily accommodated by a contract offer from the Philadelphia Athletics of the American Association. He quickly accepted. In all, Gunning saw playing time in only 23 games for the third-place (81-52) Athletics. And with his hitting reverting to the norm (.196 BA, with no extra-base hits in 97 at-bats), Gunning’s imminent release by the club was periodically reported.42 But like his other managers, Athletics skipper Billy Sharsig valued his “brainy” reserve catcher. “Gunning is not only a great backstop and a fine coach of young pitchers … he is a great base runner, good bunter, and sacrifice hitter,” declared Sharsig upon re-signing Gunning for the 1889 season.43 But Tom’s playing days were approaching their end. Again plagued by arm miseries, he appeared in only eight games, batting .250 (6-for-24, including his second and final major-league homer) before drawing his release in early July. Gunning was one of eight umpiring applicants accepted by the PL, and paired for duty with retired pitching star Bobby Matthews. But his integrity, acquaintance with many in PL ranks, and prior umpiring experience notwithstanding, Gunning’s time in blue would be short and rocky. A stickler for the rules, he quickly disconcerted veteran pitching star Pud Galvin by deeming his odd but long-tolerated pickoff move a balk. Nor would Gunning abide disrespect. He imposed the league’s very first monetary sanction, a $10 fine on Hugh Duffy for kicking about a decision. Gunning even had the temerity to fine PL organizer John Montgomery Ward – twice.49 A backlash, particularly in the New York press, was not long in coming, and Gunning would not abide that, either. He resigned his position in June, vowing to return to baseball as a player as soon as his arm came around.50In the meantime, he returned to his medical studies in Philadelphia. On May 2, 1891, Thomas Francis Gunning was awarded his doctor of medicine degree.51 But before taking up practice, he and 10 other Quakers players represented the University of Pennsylvania in games played against Lafayette, Lehigh, and other eastern Pennsylvania college nines.52 Thereafter, young Dr. Gunning returned to Fall River, where he quickly established a thriving medical practice.53 Over the next four decades, he would also take an active part in the political and civic affairs of his hometown and the surrounding region. Soon after Gunning got himself established professionally, he was called upon to perform support duties in the event that forever embedded Fall River in American folklore: the August 4, 1892, double-murder of her parents charged against Lizzie Borden. The autopsies were conducted by Fall River Medical Examiner William A. Dolan, assisted by various local physicians including young Dr. Gunning, and established that Andrew Borden and his wife, Abby, had each suffered multiple incised wounds to the head consistent with having been struck by an axe-like weapon. Given his inexperience in pathology at the time, Gunning was little more than an observer and was not called as a witness at the ensuing trial which, despite strong evidence of culpability, ended with Lizzie Borden’s acquittal. Meanwhile, Gunning involved himself in local Democratic Party politics, serving as the party’s nominee for Fall River School Committee in the election of November 1892. Later, he served as a councilor for Ward 6. There were developments on the domestic front, as well. In 1893 Gunning married Fall River resident Ida Corcoran, who in time, would bear him three children: Hester (1894-194? ), William (1896-1897), and Thomas Corcoran Gunning (1899-1947). Like their father, Hester (Smith College) and Thomas (Brown University, thereafter a Catholic seminary) would receive the benefit of elite postsecondary-school educations. Suffering from heart disease, Tom Gunning suffered a heart attack and died at his Fall River home on the morning of March 17, 1931. He was 69.56 Packing Sacred Heart Church for the Funeral Mass were legions of the area’s religious, civic, and political leaders. Services were concelebrated by church dignitaries and the Reverend Thomas C. Gunning, by now a curate at Sacred Heart.57 Interment at North End Burial ground in Fall River followed. Survivors included his widow, Ida Corcoran Gunning; children Hester Gunning Lord and the Reverend Thomas Gunning; and sister Anne Gunning Boylan. Looking back, Tom Gunning was a journeyman ballplayer, at best. In 146 major-league games (all as a catcher) spread over six seasons, he had batted a mere .205, with little extra-base power. And his defensive stats – a .887 lifetime fielding average, with 123 errors and 133 passed balls – do not impress on paper. But the frequent praise that his catching received in the press of his day, the esteem in which he was held by managers and fellow players, and the improved performance often shown by the pitchers whom he handled, suggest that Gunning was a useful member of the clubs that he played for. More important, his life was much more than just baseball. All in all, Tom Gunning, major-league ballplayer and umpire, Fall River physician and medical examiner, local political and community leader, and devoted family man, led a long, eventful, and productive life. Most would envy leaving such a memory. The writer is indebted to Dr. Phil Silvia, fellow SABR member and Fall River historian, for his assistance and feedback on this bio. Sources for the biographical details provided herein include the Tom Gunning file at the Giamatti Research Center, National Baseball Hall of Fame and Museum, Cooperstown, New York; family tree information accessed via Ancestry.com; and certain of the newspaper articles cited below, particularly the Gunning obituary published in the Fall River (Massachusetts) Herald News, March 17, 1931. Baseball stats have been taken from Baseball-Reference.com and Retrosheet. 1 The descriptive employed in the brief obituary circulated by the Associated Press. See, e.g., the Dallas Morning News and The (Portland) Oregonian, March 18, 1931. 2 1920 and 1930 US Census listings for Tom Gunning, as well as his 1931 obituary in the Fall River Herald News, list his father as having been born in England. This is wrong. As reflected in his naturalization papers, Massachusetts death record, and other contemporaneous documents, Robert Gunning was born in Ireland on April 12, 1833. He emigrated in 1850, sailing from the English seaport of Liverpool, and became an American citizen in February 1871. Son Tom was presumably named for his Irish grandfather Thomas Gunning. 3 Because the elder Gunnings could not be located in US Censuses, the number of Gunning children is unclear to the writer. At a minimum, Tom had a younger brother named John A. Gunning (1868-1922), a pitcher for the College of the Holy Cross in the late 1880s and later a druggist in Fall River, and there may have been another brother named George (as a George Gunning of Fall River was a Holy Cross classmate of John). Sister Anne Gunning became the wife of a Fall River physician named Boylan. 4 According to the Wikipedia entry on Fall River. 5 See an undated 1886 New York Clipper profile of Gunning contained in the Tom Gunning file at the Giamatti Research Center. No trace of the Gunning name, however, could be detected in the half-dozen 1882 Merritt club news articles/box scores examined by the writer. According to his hometown newspaper, Gunning’s first professional engagement was with the 1882 Atlantics of Brooklyn. See the Fall RiverDaily Herald, April 4, 1882. 6 Guy McIlvain Smith, “Death of Thomas Gunning Recalls Pioneer Days of Baseball in Springfield,” Daily (Springfield) Illinois State Journal, March 22, 1931. 7 According to the Boston Journal, October 1, 1884. Baseball-Reference provides no stats for Gunning’s season in Springfield. 8 For more detail on the contretemps, see the Boston Herald, November 25, 1883. 9 While still a member of the Springfield club, Gunning had somehow managed to catch Buffinton in an exhibition game played by the Beaneaters in New York against the New York Mets of the American Association, as reported in the Boston Herald, August 8, 1883. 10 Chicago Browns manager Ed Hengle later observed that Gunning had “the honor of signing the first Union Association contract, [and] also the honor of being its first contract jumper,” as quoted in the Cleveland Leader, March 13, 1884. 11 As related in a letter to a friend by Jim Manning, published in the Daily (Springfield) Illinois State Register, January 13, 1884. 12 As explained in the Baltimore Sun, April 24, 1884. The Massachusetts League was disbanded once the Union Association expired at the end of the 1884 campaign. 13 As per the Boston Journal, October 1, 1884. Baseball-Reference has no stats for Gunning’s time with the Boston Reserves. 14 Peter Morris, Catcher: How the Man Behind the Plate Became an American Folk Hero (Chicago: Ivan R. Dee, 2009), 133. 16Cleveland Leader, October 20, 1884. 17 As reported in the Boston Herald, January 6, 1885. Not to be confused with the upper-crust sport played on horseback, roller polo was a full-contact indoor game, something like hockey played on roller skates. However curious, Gunning would remain interested in roller polo for years, later serving as an officer in a league organized by Boston ballplayer-turned-sportswriter Tim Murnane. 18Boston Herald, March 29, 1885. 19New York Tribune, July 17, 1885. 20Boston Herald, August 1, 1885. 21Sporting Life, August 5, 1885. 22Boston Herald, August 8, 1885. 23 Baseball-Reference charges Gunning with 48 passed balls, but contemporary sources put the number even higher. According to Sporting Life, October 21, 1885, “[Buffalo catcher George] Myers and Gunning had the most passed balls among League catchers with 50 apiece.” See also the New Orleans Times-Picayune, October 23, 1885. 24Boston Herald, November 11, 1885. Elsewhere, it was reported that Gunning (whose 1886 salary was $1,900, according to the Trenton Times, September 8, 1886) had “saved enough money to buy a good home for his parents in Fall River.” The Sporting News, January 6, 1886. 25 As per the Boston Herald, January 14 and February 18, 1886. 26 As reported in the Boston Herald, April 6, 1986. 27 As reported in the Boston Journal, May 17, 1886, and The Sporting News, May 21, 1886. 28 Gunning himself was reported to have said that Stemmyer was so fast and unmanageable that “any backstop who catches him with a [fielding] average of .750 will have a big record.” See the Kansas City Times, May 24, 1886. 29Boston Herald, October 6, 1886. 30 See, e.g., the Washington (DC) Evening Star, September 25, 1886: “Radical changes are expected with the Boston club,” naming Gunning and Buffinton as among those likely to be jettisoned. 31 As reported in the Boston Herald, March 6, 1887. Two weeks later the Herald reported that Gunning was coaching the team at Holy Cross, but that report appears unfounded. Although the March 1931 Gunning obituary in the Fall River Herald News and contemporary sources like Baseball-Reference maintain that Gunning attended Holy Cross, the college has no record of him attending school there, even briefly, as per email of Mark W. Savolis, Head of Archives and Special Collections, College of the Holy Cross, dated October 7, 2014. Given this, the Gunning in question was more likely Tom’s younger brother John Gunning, a pitcher on the Holy Cross teams of the late 1880s, or another Gunning from Fall River then at Holy Cross named George. 32 Tom Gunning attended Boston College as a student during the 1886-1887 academic year, but not thereafter, as per email of Shelley Barber, Reference and Archives Specialist, John J. Burns Library, Boston College, dated October 9, 2014. 33 As reported in the Boston Herald and Philadelphia Inquirer, April 6, 1887, and elsewhere. The purchase price for each player was reportedly $500. 34Philadelphia Inquirer, April 6, 1887. 35Boston Herald, April 25, 1887. 36 As reported in Sporting Life, July 13, 1887. As elsewhere, Gunning remained well-liked by his ex-teammates in Boston. 37 According to the Philadelphia Inquirer, October 24, 1887. Later the newspaper added that “all the Philadelphia players regret [Gunning’s] release.” See the Philadelphia Inquirer, November 2, 1887. 38 As reported in the Philadelphia Inquirer, November 8, 1887, Sporting Life, November 9, 1887, and Cleveland Leader, November 10, 1887. 39 The game marked Stemmyer’s the next-to-last major-league appearance. Whether a coincidence or not, the once-promising career of the young hurler went into a tailspin as soon as he was separated from catcher Gunning. 40 See e.g., the New York Herald, August 14, 1888, and Sporting Life, August 20, 1888, both of which commended Gunning’s work. The hometown press was similarly impressed. “Gunning acted as umpire and he did not make a single faulty decision during the game,” said the Kansas City Star, August 14, 1888. 41 As noted in the Cleveland Leader and Philadelphia Inquirer, August 13, 1888. 42 See e.g., the Philadelphia Inquirer, July 31, 1888. 43 As quoted in Sporting Life, November 14, 1888. 44Philadelphia Inquirer, August 10, 1889. 45Boston Herald, July 24, 1889. 46 As per the Boston Herald, August 14, 1889, and Sporting Life, August 21, 1889. 47 As later noted in the Philadelphia Inquirer, February 2, 1890. 48 As reported in the Cleveland Plain Dealer, December 22, 1889, Sporting Life, December 25, 1889, and elsewhere. 49 As reported by Sporting Life, May 17, 1890. The sanctions, a $20 fine in New York and one for $10 more in Boston, were reportedly the first imposed on Ward in his [then] 12-year major league career. 50 See Sporting Life, June 14, 1890. Immediately after his umpiring resignation, Gunning turned down a catching job offer tendered by the hapless Brooklyn Gladiators of the American Association, according to the Boston Herald, June 19, 1890. 51 As reported in the Philadelphia Inquirer, May 2, 1891. 52 As reported in the Philadelphia Inquirer, May 11, 1891. 53 “Tom Gunning, the old Boston catcher, is now a doctor in Fall River and has a large practice,” reported the Boston Herald, January 27, 1892. “Tom Gunning is succeeding finely in his practice as physician in Fall River,” declared the Philadelphia Inquirer, April 11, 1892. 54Boston Herald, July 28, 1907. 55Boston Herald, April 7, 1929. 56 His obituary was published the same date in the Fall River Herald News. 57 As per the Fall River Herald News, March 20, 1931.